UK CCTV manufacturing company, 360 Vision Technology, has announced the release of an upgraded Invictus ultra-low-light, high-performance, HD ruggedised PTZ camera. Bridging the divide between analogue and IP systems, and coupled to attractive pricing, the upgraded Invictus features a further reduction in power consumption, offering system operators even greater energy savings, allied to lower running costs. Encompassing an ultra-reliable and accurate self-calibrating Direct Drive pan & tilt mechanism, Invictus also features 360 Vision’s‘Attack Detect’,that automatically responds to a detectedincrease in camera load (such as the camera being struck by an object). On detection, the camera’s direct-drive pan & tilt mechanism instantaneously disengages to prevent damage to the motor drive. A ‘self-check’ routine then establishes if the camera has altered its direction of view during the attack, and an automatic re-initialisation is triggered – returning the camera to its last known position prior to the impact. The benefits of Invictus’ Attack Detect response to system operators is that post-attack, the camera returns to its correct field of view, prior to being forcibly moved. This means that vital evidential footage will continue to be captured, and without the need for operator intervention. The feature also ensures that all camera-preset positions remain intact – which is vital to avoid disruption to the daily running of a surveillance system due to inaccurate preset positions. Completing the upgraded Invictus’ camera package, high-quality paint finishes are available in black or white, or for operation within marine environments, a long-life paint option can be specified. 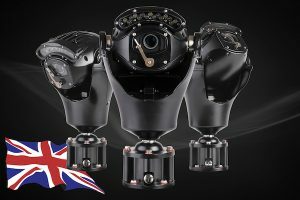 In addition, Invictus is supported by 360 Vision’s UK based design and manufacturing resource, and a comprehensive 3-year warranty, or an enhanced optional 5-year full warranty on request.